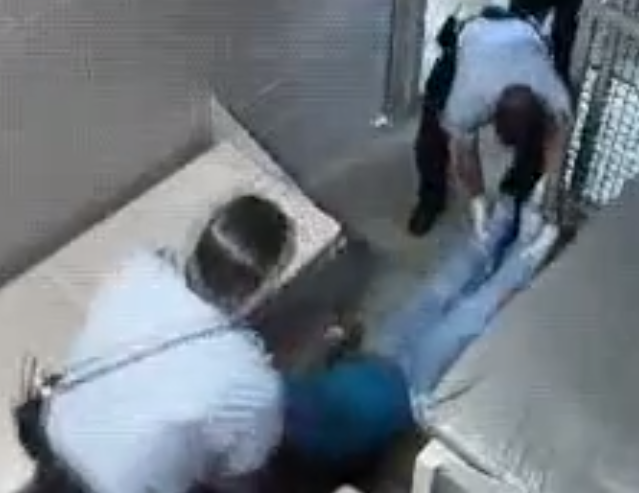 Richmond Heights Police drag Ms. Anna Brown into a jail cell, where she died 15 minutes later. RICHMOND HEIGHTS — The United State Supreme Court heard the opening round of oral arguments today on, inter alia, the constitutionality of the individual mandate contained in the Patient Protection and Affordable Care Act, which is now better known as “Obamacare.” The family of Ms. Anna Brown can now only wonder if the health law would have saved their loved one. The video, first obtained by the St. Louis Post-Dispatch, is horrifying to watch and listen to, and brings to light problems not only with health care in America, but also police thuggery and disconnect from the people they allegedly are sworn to protect. First, here is the video of the September 21, 2011 incident, which has just being made public in the last 24 hours. Ms. Brown, 29, had sprained her ankle that week and on September 20, went to Saint Louis University Hospital for treatment. The X-rays were negative, so she was given painkillers and discharged. But Ms. Brown was not satisfied, sensing something more was wrong with her. She refused to leave the hospital, so police were called. Ms. Brown, in a wheelchair due to the pain in her legs, rowed herself next door to a children’s hospital since the instant hospital would not help her. Though doctors at the children’s hospital said she did in fact have tenderness in her legs, they said they could not treat her because it was a pediatric hospital. Refusing to return to SLU Hospital, an ambulance took her to SSM St. Mary’s Health Center, a hospital with a mission statement emphasizes “special concern for people who are materially poor and marginalized.” Ms. Brown was homeless and on Medicaid after a tornado in 2010 destroyed her home and she lost her job at a sandwich shop. Ms. Brown was given ultrasounds on both legs, which did not find any blood clots or other abnormalities, according to State inspectors who examined her medical records. The hospital gave Ms. Brown the number to several homeless shelters and sent her on her way. But Ms. Brown returned eight hours later, now complaining of leg and abdominal pain. Hospital staff refused to treat her, giving her discharge papers which she refused to sign. Richmond Heights Police, who were already at the scene, wheeled Ms. Brown out of the hospital, as she yelled “my legs don’t work!” At the request of the hospital, police arrested Ms. Brown and charged her with trespassing. When they arrived at the jail, Ms. Brown told the police she could not put pressure on her legs, so they dragged her out of the car by her arms. Police listed “possible drug use” as their reason for Ms. Brown’s behavior, since hospital staff told them she was “fit for confinement.” Though the woman moaned in pain and begged for help, police dragged her into a jail cell and laid her on the concrete floor, despite a cot being next to her. Ms. Brown stopped moving and breathing fifteen minutes later. Paramedics tried to revive her without success, so they rushed her back to St. Mary’s, where she died within an hour. The autopsy revealed she died from blood clots in her legs that ultimately lodged in her lungs. Ms. Dorothy Davis, Ms. Brown’s mother, blamed herself for not being there for her daughter, but also questioned the entire incident. The State of Missouri, when they took Ms. Brown’s kids after she lost her home and job, forced Ms. Davis to choose between taking in her daughter or her grandchildren…a decision nobody should ever have to make. Ms. Davis wondered why her daughter was not treated properly and if police did something further to her daughter which caused her death. Many individuals took to Facebook to share their experiences at St. Mary’s Health Center, many of which were not positive. One has to wonder if Ms. Brown had coverage via “Obamacare,” would she still be alive? It appears the hospital either negligently missed the blood clots a few hours before Ms. Brown’s death, or deliberately ignored them to avoid treating her due to not having insurance beyond Medicaid. Obamacare, in truth, is nothing but a stimulus package for big pharmaceutical and insurance companies [and the Federal Reserve], as it hands said industries 50-plus million federally-mandated new customers. Nobody will really know how the reform bill will work until its implemented in 2014, but we do know it has indebted the USA further to private foreign central bankers who already own every citizen in this country. But this kind of cruel, unnecessary death will keep the country divided over this issue, which is exactly what the banksters want. The police cannot be faulted for Ms. Brown’s death based on the facts known at this point, but they certainly displayed typical android-like indifference, dragging a dying woman around like a rag doll. We will continue to follow this story and update if/when more information becomes available. It would be appropriate if the FBI became the lead agency for this (murder) case. 1. The doctor(s) and nurse(s) hospital personnel file must be looked at for the following: discipline, training, and complaints. 2. Hours worked that day. 3. Whereabouts prior coming to work. 3. Credit card purchases. 4. Personal medical history file (prescriptions). 4. Forensics must be done on all home computers, some job computers, hospital phones in the area, and cell phone(s)/ home phone. 5. Investigate what religion and clubs the doctor(s) and nurse(s) belong to.